I also created a Blogroll (tab at top) listing a few of my favorite blogs. In other news, today I had my lower wire retainer removed – FINALLY! You may have read about the issues I was having with it, so I am glad to have it taken out. My teeth feel so odd now. After that was done, since I was in the area (had to drive home to my old orthodontist’s office to get it done! 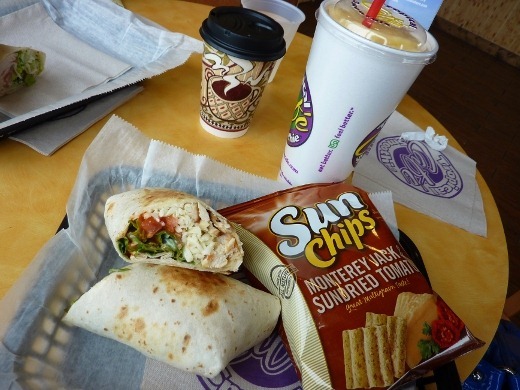 ), I met with and had lunch with my mom at Tropical Smoothie Café, where I had a Buffalo Chicken wrap, and an Island Fever Smoothie with pineapple, peach, and banana. The wrap was actually really delicious, and so was the (huge) smoothie. Smoothies always remind me of being a college freshman because I ALWAYS used to use my “entrée plus” money, or meal points, to buy smoothies. 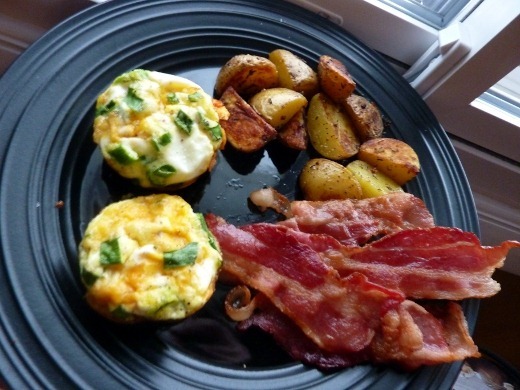 For dinner, I made Mini Ham ‘n Cheese Frittatas again (love this recipe!! ), some roasted Yukon Gold potatoes, and some bacon that I had leftover from making THIS yesterday. Then I shredded! Currently listening to: Codex – Radiohead. By far my favorite song off their new album.